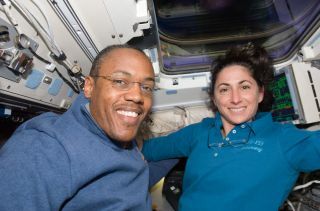 Astronauts Alvin Drew and Nicole Stott, both STS-133 mission specialists, take a break from flight day 2 duties on Discovery's aft flight deck on Feb. 25, 2011 during the STS-133 mission. HOUSTON – It looks like the glitz and glamour of the Academy Awards won't quite make it into space this year. On Saturday (Feb. 26), the six astronauts on NASA's shuttle Discovery joined up with the crew of the International Space Station for a week of work installing spare parts, a storage room and a humanoid robot called Robonaut 2. Amid all their work to transfer cargo between the two spacecraft, all 12 astronauts aboard both spaceships (there as six on the station) will likely skip tonight's film awards show, NASA officials said. Bryan Lunney, lead flight director for Discovery's STS-133 mission, told SPACE.com that he was unaware if anyone had specifically requested to see the Oscars from onboard the space station, but that it was unlikely given their full schedules. But, it's not all work and no play up on the International Space Station. The space station crew has watched at least one of the films nominated for Best Picture this year – "The Social Network" based on the rise of the Internet social media network Facebook, NASA officials said. Even though the orbiting laboratory flies 220 miles (354 kilometers) above Earth, NASA has ways of beaming entertainment such as movies or the news, to the astronauts to help them unwind. So the shuttle and space station crews will be able to eventually find out the winners and losers of the 83rd annual Academy Awards after the show, if they desire. "There is live Internet onboard the space station now, so they can get on the web and that's one way they can get the news," NASA spokesman Kelly Humphries told SPACE.com. "They also have The Houston Chronicle e-mailed to them every day. But, anytime they want to request specific information, or watch something special, they can send that down as an e-mail request." If any of the astronauts did want to watch the Academy Awards tonight, for instance, they can request to have the program sent to the station, NASA officials said. But, they will have to wait even longer to find out who the lucky winners are this year. For a program like the Oscars, there would be a delay because NASA is unable to transmit television shows in real-time. So the shows are recorded and then sent electronically instead. "The stuff we send them generally isn't live, so it's usually sent up after the fact when it would not be a hardship on the station operations," Humphries said. Most frequently, astronauts on the station ask to see certain football games, he added. The station residents also have a fairly large collection of CDs so they can listen to music, and movies can be sent for them to watch, although those files tend to be quite large, Humphries said. And even though they won't be tuning in to see the awards show itself, Humphries did say that the station residents have watched the Oscar-nominated film, The Social Network. Still, majority of the astronauts' time onboard the station is dedicated to work. "They're pretty busy, so they don't spend that much time watching movies or the news," Humphries said. "They have some time for that stuff during their post-sleep period, or when they're exercising, sometimes they can put something on the treadmill screens." The mission is the final flight for shuttle Discovery, which will be sent to a museum for public display after NASA retires its 30-year space shuttle program later this year.